For the uninitiated/unobsessed, Gail Simone is famous for being the first female lead writer on Wonder Woman (somehow that title made it to 2007 without a female head writer, which is deeply sad) and for being the originator of the term "Women in Refrigerators", aka, fridging a female character. Granted, her version of Wonder Woman wasn't the most progressive in the world, and she does skew more vintage than I do in her comics storytelling style, but still. Mad respect. The comic will be picking up where the videogame series left off. 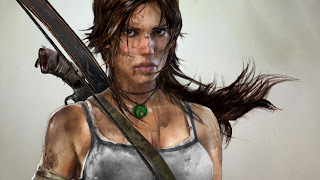 If you'll recall, the series was recently rebooted, so the Lara we see in the Tomb Raider comic will be a younger, less experienced character, which has its good and bad points. Plus side, it's more interesting this way and there's a lot of potential for story growth. Downside, I like older experienced badass Lara. The comic isn't coming out until February of 2014, but I'm still super excited. However this pans out, it means we get more Lara Croft in our lives, and that's always a good thing. For more on this, check out the MarySue.